Book: Orange Pear Apple Bear by Emily Gravett. This is a silly story that's fun to read and just uses four words throughout most of the book. 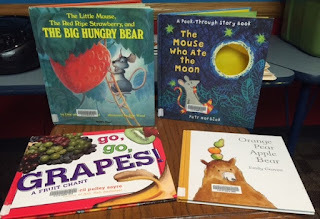 Families were chuckling along at the funny illustrations and this is a great book to demonstrate rhyming words since "pear" and "bear" appear on almost every spread. When children hear and recognize rhyming words, they are learning that words are made up of smaller sounds (phonological awareness), which is an early literacy skill. Book: The Little Mouse, the Red Ripe Strawberry and the Big, Hungry Bear by Audrey & Don Wood. This is a favorite with many of our kids and a lot of my storytimers were familiar with this one. I love to share old favorites to demonstrate a love of reading and reassure parents that it's a-okay to read your favorites over and over again! Book: Go, Go Grapes by April Pulley Sayre. How do I love April Pulley Sayre, let me count the ways... She writes awesome and accessible nonfiction for very young readers. This one in particular has a great rhythm and rhyme and introduces kids to lots of new words - many fruits that I was not familiar with. Part of the reason I wanted to do a fruit storytime is that I had learned some new-to-me action songs that fit perfectly! This one was really fun. We did it twice! Book: The Mouse Who Ate the Moon by Petr Horacek. This is a cute story about a mouse who thinks he's found a piece of the moon when he spies a banana outside his house. It smells so delicious that Mouse can't help but nibble and soon he's eaten half of it and he despairs that the moon will never be round again! Bright, colorful pictures make this a great one for sharing. 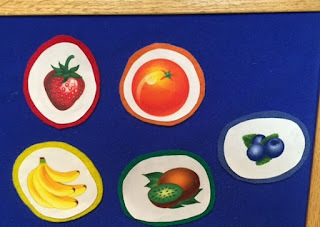 Felt Activity: Fruit Salad! As we like to do here, I passed out pieces of our fruit salad felt set and let the kids bring them up as I called their fruit. We made fruit salad together! After everyone had brought up their fruit, we talked about the rainbow of fruit that we had on the board and we counted our pieces together (a sneaky way for me to get a count for our stats!). Book: The Very Hungry Caterpillar (pop-up) by Eric Carle. This is another classic favorite and the pop-up format gives it a twist that's something new for kids who have the original book at home. The whole reason I wanted to plan another fruit storytime was to include this fun song and then we ran out of time and I didn't get to do it! Ah, well. I think next summer's theme is going to be Health, so I can definitely fit another fruit program in there! PS: These action songs are expertly demonstrated by the lovely ladies at Jbrary and if you're not using them as a resource for songs and rhymes, you should start now!!! Play Time: For summer, we're keeping it easy and I just pulled out the blocks and the play food/dishes and the kids had a great time. These simple basics are a great investment and encourage lots of imaginative play!